This page presents highlights of major expeditions organized in the past. "When we decided to climb Mt. 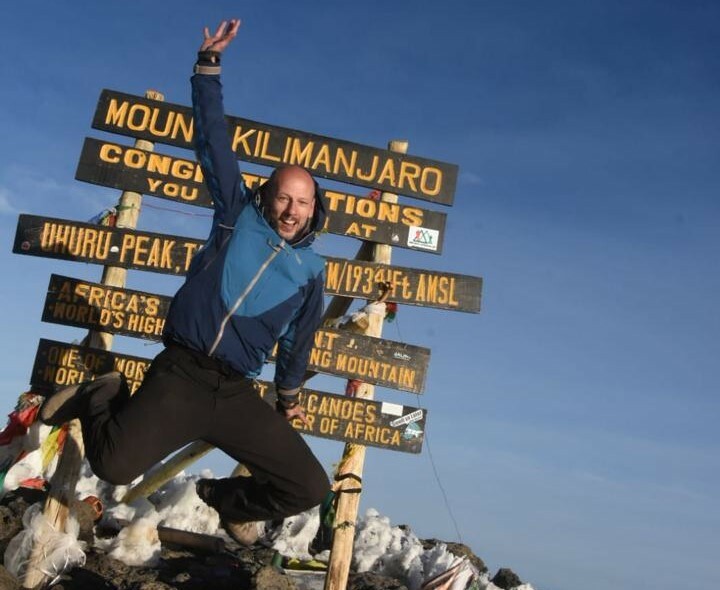 Kilimanjaro, we knew that our main task was to find a reliable guide who would understand our requirements and help us fully experience the climb for a reasonable price. After weeks of extensive searching, we got a recommendation for Bakari and a few exchanged emails were enough to make the decision, because unlike with other travel agencies, we were talking directly to the guide who would go to the summit with us. Given the fact that we wanted to carry our own equipment up to the summit, we really appreciated Bakari's advice regarding the route selection, necessary equipment etc. In the end, we decided for Marangu route over 5 days, but with only 4 porters (for 5 people) who carried our food. 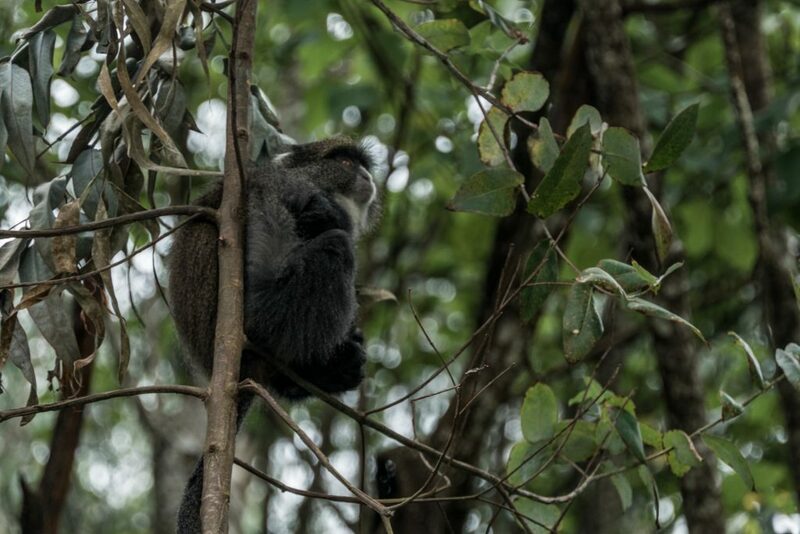 We visited Kenya and Tanzania during our trip, and since we organized it by ourselves, we had to change our plans for the Kilimanjaro trek and Safari visit, and thus we appreciated Bakari's flexibility. Upon arrival in Tanzania, Bakari waited for us at a hotel, explained all the details about the upcoming days, and most importantly assured us from the start that we would all manage to make it to the summit. After visiting Ngorongoro and Tarangire, we moved to Moshi and the climb could start. 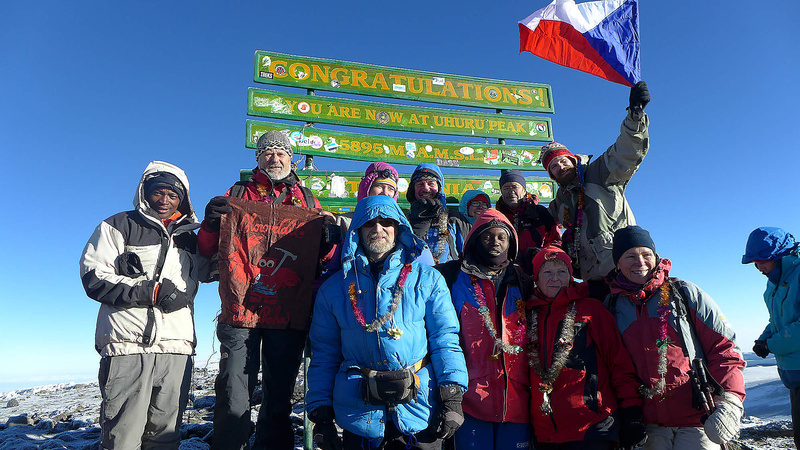 Marangu route is the shortest one, where a climber walks 10 km and ascends 1000 metres each day, to reach Kibo Hut under the summit at an altitude of 4 720 m after 3 days. We are at all times accompanied by our guide, who not only helped set the pace, which as we later realized is a cruicial thing for successfully reaching the summit, but who also brightened our days by talking about Tanzania, its people, culture, etc. The accommodation on the Marangu route is strictly in huts, but a warm sleeping bag is still a must to enjoy a comfortable sleep. At Kibo Hut, we had dinner and received the final info about the climb, as well as many pieces of advice. We had a short sleep and at midnight, we started to head up. We could see a trail of lights winding their way up, and despite feeling like we were moving at a glacial pace, we gradually managed to get to the front. The guides set the pace and told us when to stop for breaks, and thanks to this we managed to gradually get accustomed to the altitude and all five of us steadily kept ascending. During the climb, we also realized that the guides were not only there to show as the way, but also to motivate and help us get to the summit. When any of us started having doubts due to the lack of oxygen, they kept cheering us forward. After about 6 hours, we reached the edge of the crater at Gilman's point, and we had the last 200 metres of altitude left to go. Finally, after 6 and a half hours, we reached the top just as the sun began to rise, and we started to thaw up. Not just literally, but also due to the influx of emotions. We made it. After staying for a couple dozen minutes, we started the descend to Kibo Hut and continued to Horombo Hut. The descent was not supported by the adrenalin doses we experienced on the way up, and we were happy to finally reach Horombo Hut. Thanks to Bakari, Brighton and Msafiri, all of us managed the trek and we really enjoyed it. After getting back down, Kilimanjaro did not seem like such a difficult climb, but we realized that this was mainly due to the help of our guides, who correctly set the pace. "Pole Pole", meaning slowly slowly will stay with us for a long long time." 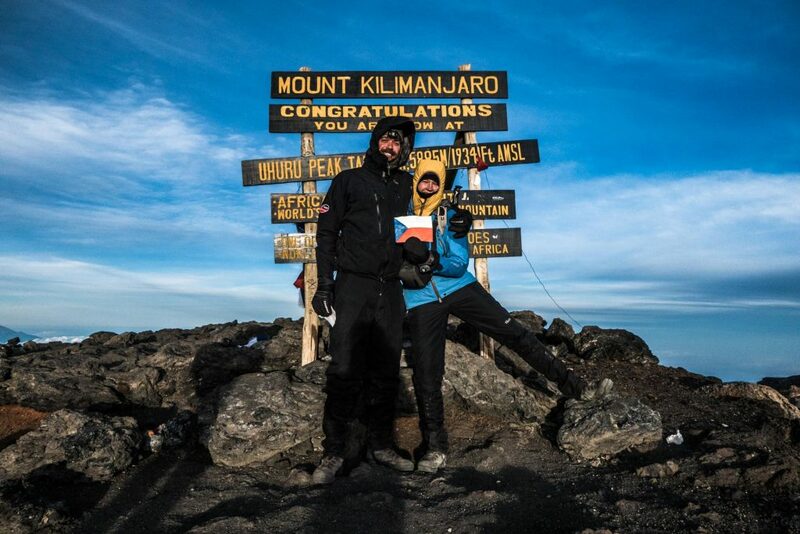 "Due to work circumstances, we set off for a trip to Kilimanjaro during the rainy season – in November. 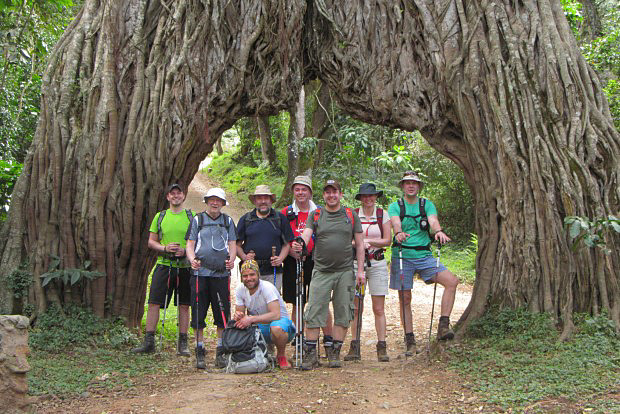 We chose a six-day trek from Machame Gate. On the way we slept in the Machame, Shira, Baranco, Barafu, and Mweka camps. Right on the first day in the rain forest zone, we were washed down by a heavy African downpour. Gore-Tex, raincoats, waterproofing – nothing helped. We were soaked wet. On the second day we crossed through a strip of tree heathers to reach an area with giant groundsels (Dendrosenecio). The path was extremely steep and in the morning we were dizzy. It was not possible to eat all the food that was served to us. The top of Kilimanjaro seemed to be quite close in the morning of the third day. The edge of its crater was clearly visible. The highest point of that day was the Lava Tower at 4 600 m. We reached it in four hours. After that we hurried down back to camp. The descent was again very steep and we stumbled down the path, which turned into a wild stream in the heavy rain. The morning of the following day offered us amazing views in all directions. The sun came out from behind the Baranco Wall where the path cuts into a broad ridge. Once we climbed the wall we were rewarded with a view over an endless sea of clouds, with only the peak of Mount Meru rising through. After another three hours we reached the highest base camp. On the fourth day we got up before midnight and put on all the clothes we had. 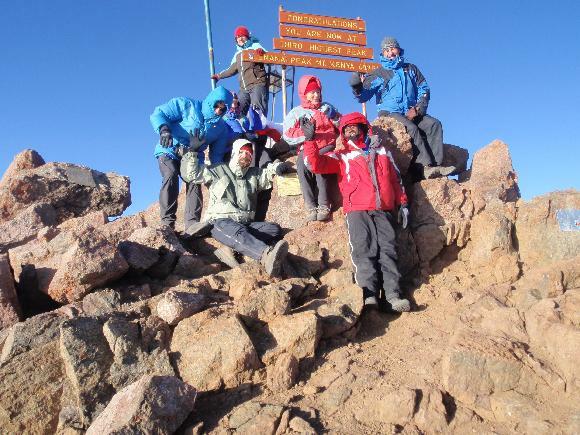 Our guides Bakari and Emmanuel, one Muslim and one Christian, prayed for a successful climb. I felt sick, probably due to nerves, or possibly the altitude or hunger. We descended down Machame Route to Barafu camp. The sun was up and it got warmer. We were finally able to see the trail and it looked quite insane. At the camp we thanked both Emmanuel and Bakari for their support and for setting the right pace, and then fell into our tent dead tired. On the morning of the last day right after packing, our porters started running down through the jungle, something forcing them towards the lowlands, while our aching knees forced us to adopt a much slower pace." 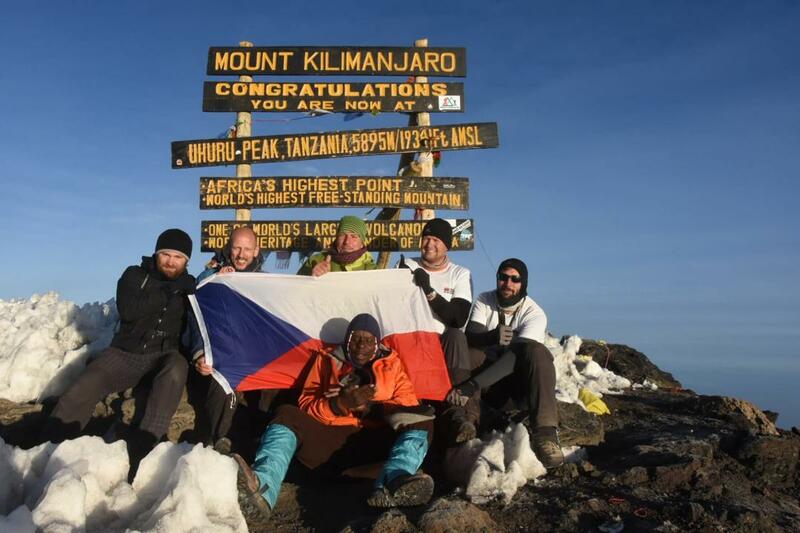 "At the end of February 2016 our group of eight men from Brno and Prague, mostly around forty, set off to Tanzania and Kenya to conquer several peaks, including the highest point in Africa - Kilimanjaro. This trip was a birthday present that I gave to myself as I turned 70. 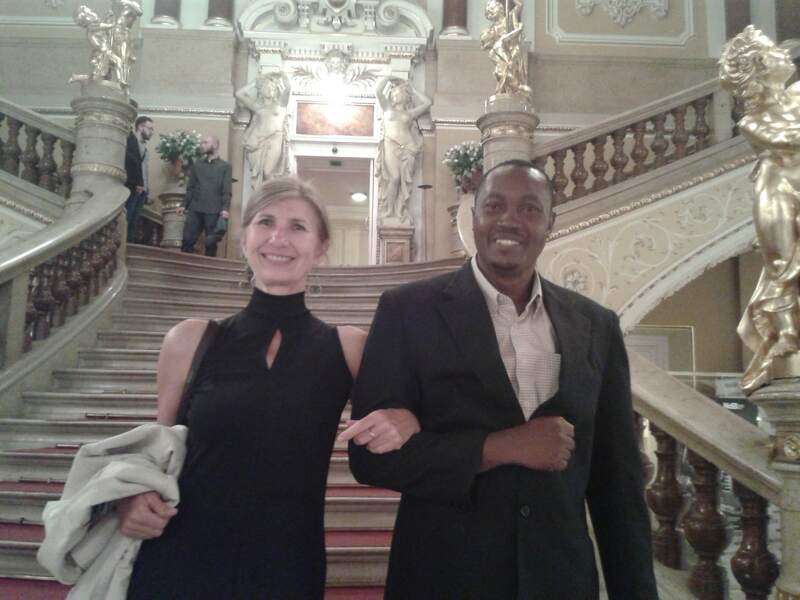 A half a year in advance I contacted a Tanzanian guide, Bakari Mwanyika, by email, who surprised me pleasantly with his web pages in the Czech language, and later with good organization of transfers, porters, accommodations, as well as good food. 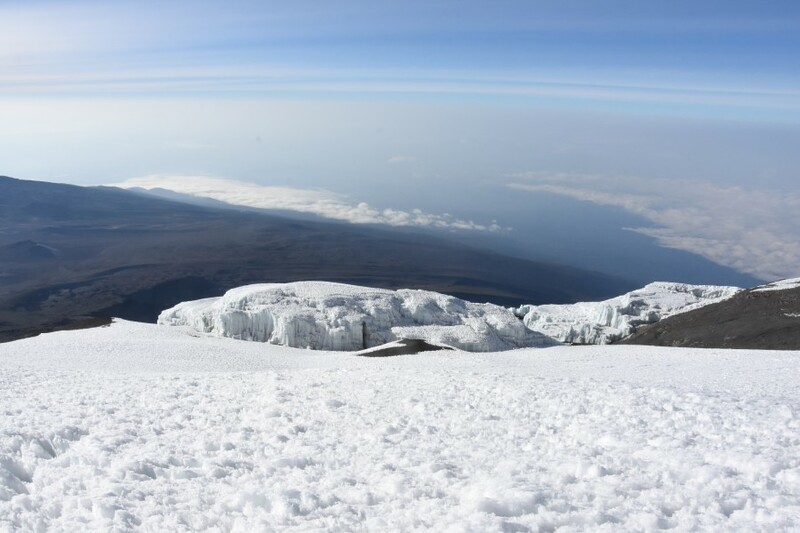 We started our expedition accompanied by an armed ranger in the Arusha National Park with a three-day acclimatization ascent to Mount Meru (4 565 m). Then a climb of Kilimanjaro followed. We chose the five-day Marangu Route that starts at a gate of the same name at an altitude of 1 700 m. Early morning on the fourth day our whole group succeeded in climbing the highest summit - Uhuru Peak 5 895 m. On the same day we made the endless descent back to Kibo Hut (4 720 m), and after a short break to Horombo Hut (3 700 m), i.e. 24 km in total and an elevation difference of 1.2 km climbing up, and 2.2 km going down. 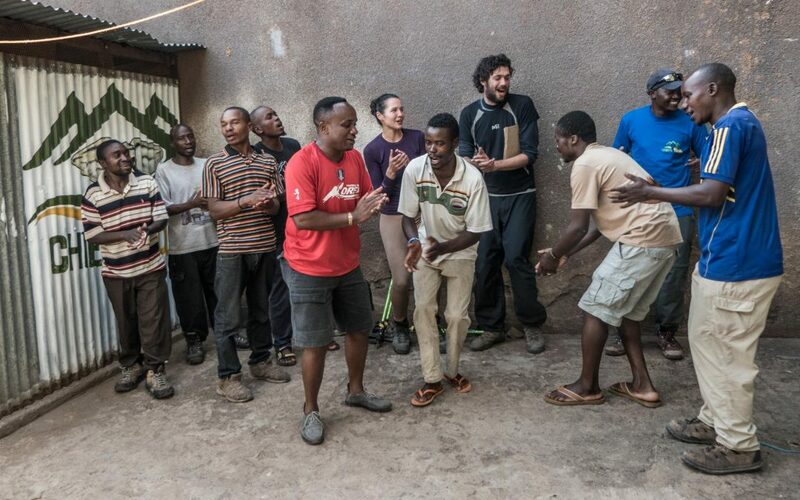 The following day it was the last 18 km through Mandara Hut back to the Marangu entrance gate, where the guides prepared for us a simple ceremony during which we were given diplomas and the traditional “Jambo bwana” song was performed. The following day we made an extremely long transfer of 520 km from Moshi through Nairobi to Naro Moru at the foot of Mount Kenya. The following morning I was feeling weak due to a cold, so instead of going with the others for a three-day climb to Point Lenana (4 995 m), I stayed together with one of the other group members in a hostel. We made a trip to the Equator in Nanyuki, visited Thomson´s Waterfalls in Nyahururu and Lake Naivasha, the second largest in Kenya, where we had a romantic boat ride amongst hippos and birds. Our successful expedition was concluded by a day-long visit of Istanbul on the way back." "In July 2014 we went to Kenya and Tanzania for a three-week holiday and Bakari organized the whole stay for us. We were a group of 9 people, members of the "Tourist Academic Club" in Prague. Based on our requirements and Bakari's comments and recommendations, we produced a schedule and then he organized our treks, transport and accommodation, as well as services provided by other agencies, e.g. safari. We spent 5 days in NP Mt. Kenya, where we climbed Point Lenana, followed by 2 days in NP Aberdare. 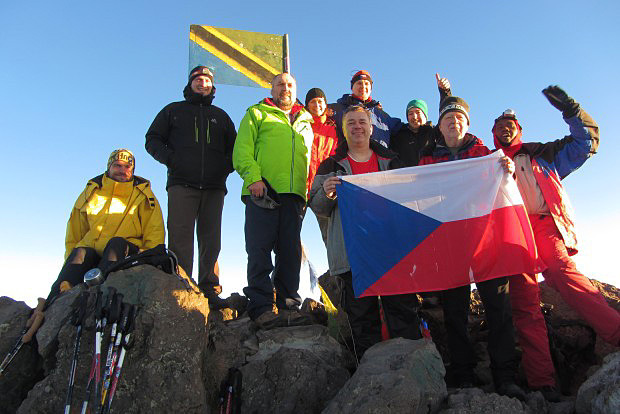 In Tanzania we climbed Kilimanjaro – our main goal. Bakari, as a licensed guide organized the whole 5-day trek and lead all of us successfully to the top. We also climbed Ol Doinyo Lengai, the only active volcano in Eastern Africa."